Ileana, Princess of Romania and Archduchess of Austria who in later life became Mother Alexandra, founder of the Orthodox Monastery of the Transfiguration in Pennsylvania wrote this memoir shortly after relocating to the US in the 1950s. It tells the story of a life full of suffering, tragedy, and exile, but all is suffused with the author's deep faith, hope, love, and even joy. This edition includes additional material collected by the nuns of her monastery that sets the memoir in the context of Mother Alexandra's later life. At one point in the book, Princess Ileana spoke those words and they could not be a truer description of who she was and what her life was. I myself listened to this book while I drove and to be honest, I found myself laughing, smiling and often times shedding a tear. It was as if she sat next to me pouring out her heart and the joys and difficulties of a life of war. Her words, I found very dear to my heart since I know what a life of a refugee is like and what a life during a war brings to a nation. Throughout the chapters, Princess Ileana became a sister, friend, and a mother to me. Her bravery, her love, and her example as an Orthodox woman amazed me with each chapter. She was a princess with a crown, but not with a modern understanding of what a princess should be. She was a princess with a crown of faith and love. The book illustrates how much she gave and learned for her people and to help those in need. Her duty to her nation is showcased in the book as she fights for her family, her nation and her people during WWII and before she left her Romania. She is a true image of what an Orthodox woman should be, and every young girl and woman should read the words of this saintly princess who spent her life giving and giving. The book also gives a historical count of what was happening in Romania and in Europe during WWII and what war truly does to humanity. But regardless of how much evil there is and all the chaos it creates, Princess Ileana shows that everything will resurrect and truly live again. This book is so good I started listening to it again. This is a fascinating memoir of an extraordinary woman's life that spanned World War 1 and World War 2 in Romania. I actually wanted it to continue into her life in the United States after she was exiled from her own country. The narration was superb. The story is one of Love, devotion and fight against evil under it's Communist manifestation. Princess Ileana of Romania, later mother Alexandra, writes a beautiful account of her service to her country, her people and her family. She also makes a plea with her book for anyone willing to read her story to help stop the totalitarian communist regime engulfing her country. The naration was overall done well with only the issue that one who speaks the language (Romanian) may have, in hearing names of places or of people being mispronounced. I wish the narrator had taken more time to learn the proper way to read and announciate those words. 13 She seeketh wool, and flax, and worketh willingly with her hands.14 She is like the merchants' ships; she bringeth her food from afar.15 She riseth also while it is yet night, and giveth meat to her household, and a portion to her maidens.16 She considereth a field, and buyeth it: with the fruit of her hands she planteth a vineyard.17 She girdeth her loins with strength, and strengtheneth her arms.18 She perceiveth that her merchandise is good: her candle goeth not out by night.19 She layeth her hands to the spindle, and her hands hold the distaff.20 She stretcheth out her hand to the poor; yea, she reacheth forth her hands to the needy. This book is not about her monastic life or the establishment of the monastery. This book is a journal of the events of Princess Ileana's life during a very specific time period- her life during WWII and after- leading up to her family leaving Romania. 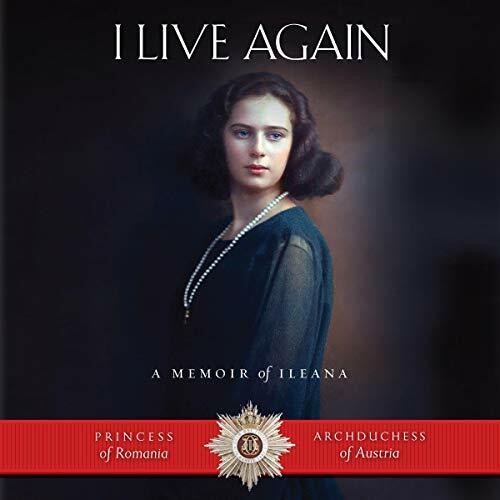 How she "lives again" as she transitions from being a princess of Romania to the Archduchess of Austria to the time of WWII, and, finally, to when she is forced with her family to leave her country. Princess Ileana was not idle- her ability to learn nursing, build hospitals, give to the poor, and convince communist officials to support her endeavors were inspiring. As I finished this audiobook, I was inspired by her untiring example of giving to others and helping her fellow man. And, her adventures, which she writes about very matter of fact (almost as if she believes that anyone else would have done the same thing which shows her true humility). I am eager to learn more about how Princess Ileana became Mother Alexandra of blessed memory, how she "lives again" in monasticism. Technically, this audiobook is very well done. The quality of the recording is amazing. The narrator, Kristina Wenger, does an excellent job- I almost believed it was the voice of Princess Ileana herself! The one downside to the audiobook is that the published book does contain illustrations and photos of Princess Ileana and her family. But, that is the downside to audiobooks, especially autobiographical books, is that there is not a way to convey the photos or artwork. We happen to own a copy of the book and I was able to look through the photos/illustrations (but I waited until after I finished listening to the book in order to write a review of the audiobook). I was gifted a copy of this audiobook for an honest review. Purchase your own copy of the audiobook through Audible.com. Last spring, I visited the Orthodox Monastery of the Transfiguration near Ellwood City, Pennsylvania. The beauty and serenity of the monastery, the prayerful services, and the sisters’ warm hospitality provided a needed respite after a busy Lenten season. It was there that I first learned of Princess Ileana, who in her later years took up a monastic vocation and, as Abbess Mother Alexandra, founded the first English-speaking Orthodox women’s monastery on American soil in the hills of western Pennsylvania. My visit coincided with the 50th year of the monastery’s founding, and with this anniversary I Live Again: A Memoir of Ileana was to be reprinted by Ancient Faith Publishing. Within weeks of its publication, I purchased the book and entered, entranced, into Ileana’s story. This is not the story of a fairytale princess. Princess Ileana writes passionately, frankly, and compellingly of her country, Romania, and of a royal life intertwined with the stark and frequently brutal realities of World Wars I and II and of the Communist takeover of her country. “Duty was the keyword of my childhood and youth,” Princess Ileana explains. “I was trained to do my duty to my country in all things … to be loyal to family and friends.” It is this sense of duty and loyalty suffused with a deep faith and fervent love for her country, her people, and her family that weaves through tale after amazing tale. I found this book hard to put down; it was like saying farewell to a dear friend when I came to the last pages. So, when the opportunity arose to provide an honest review in exchange for gratis access to the audiobook version of I Live Again I was eager to do so. A second go at the book only deepened my appreciation of Princess Ileana’s storytelling prowess. The narrator reads with feeling and a well-paced cadence, effortlessly pronouncing enigmatic Romanian names. I highly recommend this book: to men and women, to teens and adults, to fans of memoir, to fans of early to mid-twentieth century European history, to admirers of Mother Theresa (for Princess Ileana also gave her life to those in need), to those looking for inspiration from a modern-day saint who persevered through incredible adversity. I know I will be reading and listening to this book again - and sharing it with others!